It is super hot here these days in Singapore. We get thai coconut in abundance in almost all grocery shops and it is always in stock in my home. 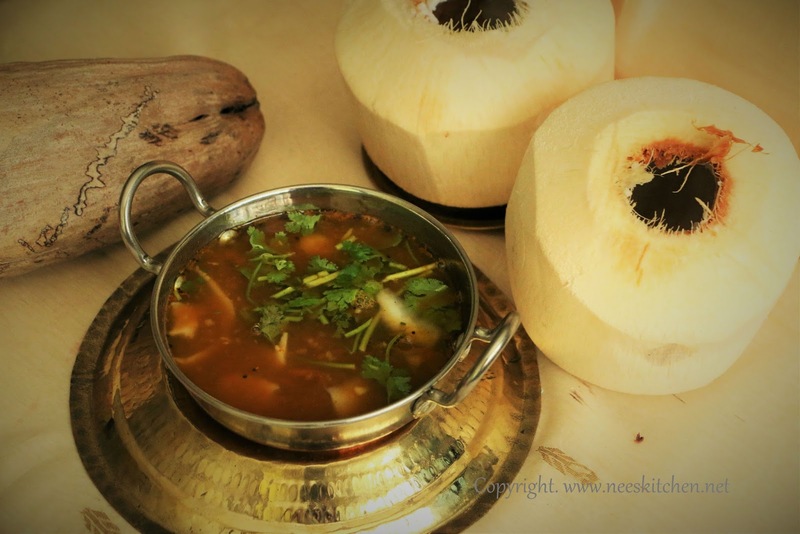 Today’s recipe is “Elaneer Rasam” where Tender Coconut water, pulp, tomato & tamarind are combined and cooked with rasam powder. The rasam's flavor is enhanced when the tempering of mustard, mint leaves & cumin seeds is mixed with it and garnished with coriander leaves. Thai coconut tastes slightly different from the Indian Coconut but both of them suits well for this rasam. You may refer to the rasam powder recipe from my blog. Make sure the coconut is sweet and do not cook the ones which are salty. 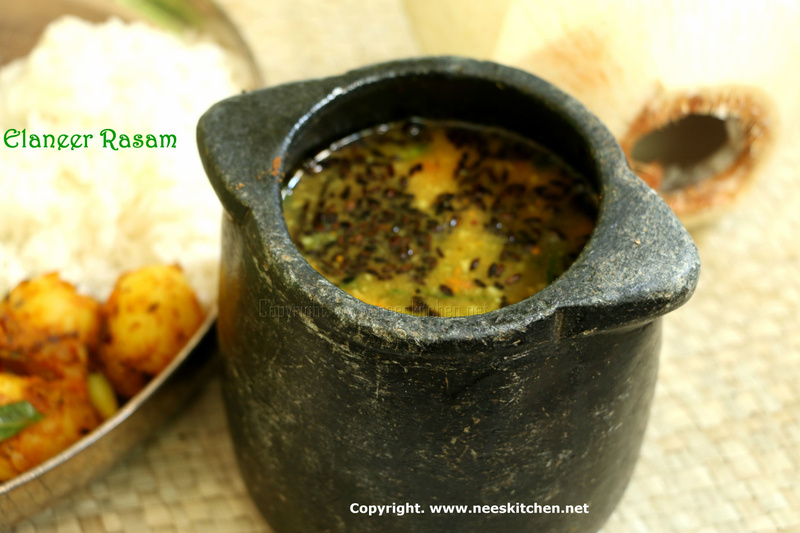 The rasam is sweet & tangy and goes well with hot steaming rice or as a soup. For more enhanced tender coconut taste it is good to put some fresh pieces of the tender coconut pulp as a part of garnishing. 1. Pour the water from the tender coconut into a cup and take out the tender coconut pulp. 3. Add the tomato-coconut-tamarind juice, turmeric, asafoetida and curry leaves in a container and bring it to boil. Stir occasionally. 4. Once boiling, add the rasam powder and mix well .Wait until frothy. 5. Add the tender coconut water. Boil for just a minute and switch off the gas immediately. 6. Temper with Ghee, mustard, mint leaves and cumin seeds . 7. Chop the remaining tender coconut pulp into small pieces. 8. Garnish with chopped coriander leaves and tender coconut pulp pieces. 1. The measurement for coconut water and tomato mix juice is same in my above dish. 2. Make sure the tender coconut is sweet and not salty as it would alter the tastes. 3. I used Kalchatti (Soap stone) to get a good flavor and has various health benefits. It retains the heat for a long time hence we need not reheat. You may use any regular rasam pots. 4. Any regular rasam powder will do. If you want the rasam to be more spicy you may increase the quantity but the measurements given above are just fine. 5. 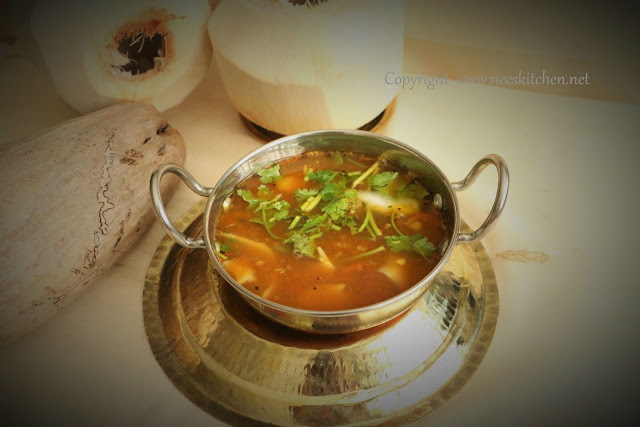 Do not add too much tender coconut pulp as it might turn the rasam to be too sweeter. 3. Add the tomato-coconut-tamarind juice, turmeric, asafoetida and curry leaves in a container and bring it to boil. Stir occasionally..
7. Chop the remaining tender coconut pulp into small pieces. Garnish with chopped coriander leaves and tender coconut pulp pieces.